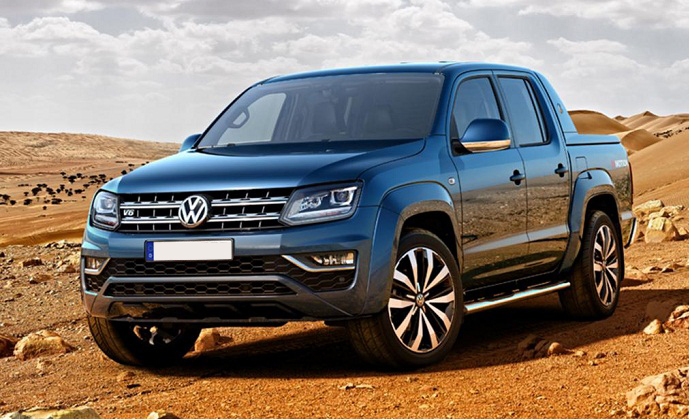 A long-awaited update of the VW Amarok made big waves in the truck industry since everybody was surprised when VW launched this impressive truck with the new V-6 turbodiesel engine. While most brands going with downsizing and turbocharging, VW decided to replace the old 2.0-liter four-cylinder turbodiesel with the V-6 Euro 6 compliant turbodiesel which provides class-leading towing capacity and performance. However, the new engine is hidden bellow refreshed exterior and Amarok also has the new and refined interior. But the 2018 VW Amarok V-6 Diesel should also bring some improvements like the new safety features and more standard equipment. The styling of the updated Amarok is not the large departure from the previous theme. Designers made most of the changes on model’s front fascia. Refreshed truck has the grille with more chrome which resides between the new headlights. The model also features sportier lower fascia and restyled fog lights. However, model’s profile, as well as the rear end, are mostly unchanged except refreshed taillights. On the other hand, the Amarok features similar contours and body sculpting but does look sleeker and more modern. So, the new model year won’t bring any radical change to model’s appearance and the 2018 VW Amarok V-6 Diesel might get new wheel designs and color options. Inside, the Amarok will reflect VW’s modern design approach seen in its crossover SUVs. The last update made the interior of this truck more car-like and added modern tech and convenience features. The Amarok now has the modern dash with the new steering wheel, modernized instrument cluster and center stack. VW also replaced old air vent with rectangular ones and the infotainment system has also been upgraded. The larger center screen with upgraded features dominates in the middle of the dash. The system benefits from improved software, upgraded voice features and there is also standard DAB radio. The driver and passengers will also love the ergoComfort front seats which come with 14-way power feature and can easily fit to any body size. For an enhanced comfort, they also offer an optional heating feature and leather upholstery. The Amarok also includes some essential safety features like a backup camera, Electronic Stability Programme, Hill Hold Assist, Hill Descent Control, Park Pilot System etc. However, the 2018 version should expand the list of safety features with the rear seat airbags and more active safety options. Under the hood of the 2018 VW Amarok V-6 Diesel will sit a 3.0-liter V-6 turbodiesel engine. It comes equipped with the BlueMotion technology as standard. This fuel economy friendly technology uses the stop-start and regenerative braking to provide best possible fuel efficiency. The V-6 engine can be also found in the Porsche Cayenne and Audi Q7 and with Amarok-specific changes, it can produce 220 hp and torque of 406 pond-feet. In the base tune, you can count on the 161 hp where VW will also offer a manual transmission. However, the higher-spec engine version will work in the combination with the 8-speed automatic transmission. VW promises around 36 mpg combined for this combination. The Amarok will be available with the rear-wheel drive and 4Motion all-wheel drive. It will provide the towing capacity of 3.5 tons. The 2018 VW Amarok V-6 Diesel should be available by the end of this year. The price should start from around $29, 000.